As promised, here comes Holiday Season's gift 2010 from PenguinDT! Time for the TAGAP 2's funky multi-genre soundtrack to make it's debut. Our music maestro Petja Heiskanen has been hard at work the music all this time. Like the soundtrack of the first TAGAP, music of TAGAP 2 is old-school videogame rock brought to life by instruments both real and synthetic. However, unlike with the original which Petja started as a MIDI project which gradually transformed into the full scale production it ultimately manifested as, he has had the true freedom of sound from the get-go. It shows, as TAGAP 2 soundtrack covers wide range of genres, all the while sounding distinctly, well, TAGAP. The debut song is aptly titled Track One. It is exactly that, the music from the very first level. 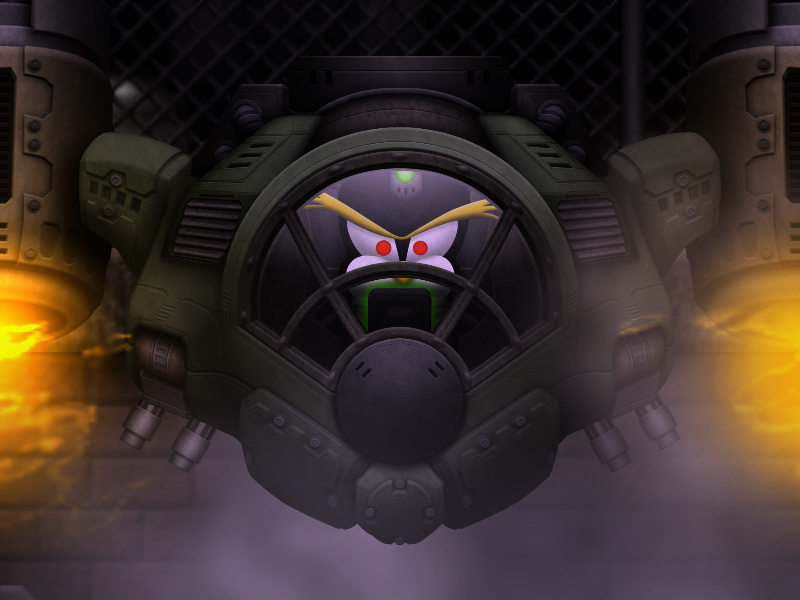 It's one of the stand-out songs of the game as it's the most mellow and relaxed one – the first level being both the warm-up for things to come and the optional in-game tutorial. 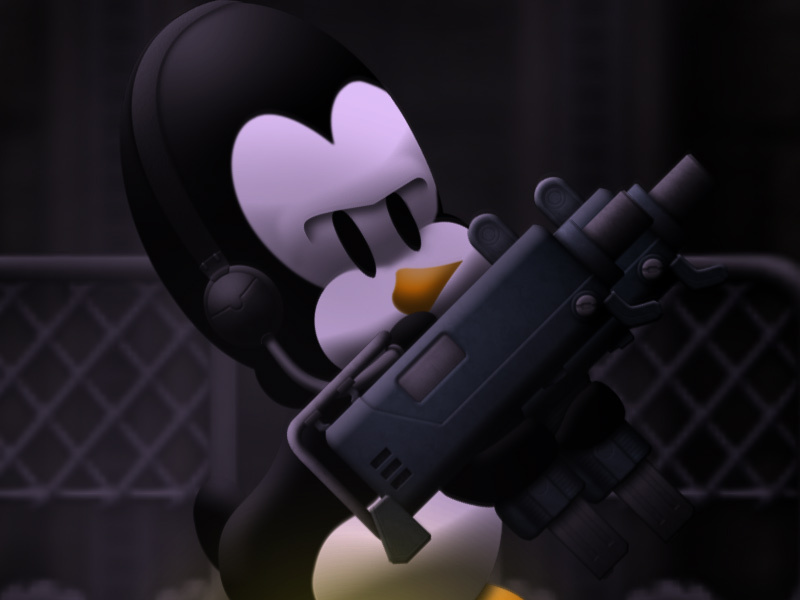 Yet beneath the mellow first impression hides a slightly twisted heart and the recurring themes from the first game work as a prelude to the second penguin apocalypse. What would be a game-related present without some new visual media. So, here are several not-yet-seen screens from TAGAP 2. Note that these screenshots have been tagged as 'beta footage'; This means they pretty much represent the final game, though some changes may still take place prior to release. First a look at our hi-res sprite version of Pablo himself. Like I explained in our earlier blog, all close-up shots use super-hi-res sprites dynamically loaded when the need arises. These sprites are split into multiple objects as well, allowing us to change expressions and postures on the fly. Also, unlike majority of games out there, Pablo will always show up armed with the weapon you used, in this case the twin uzis – which are a good example how detailed these close-up shots are. And here is Primo, in his debut scene. Don't worry this isn't much of spoiler, you knew about our new bad guy anyway, right? Like this shot demonstrates, the detail overkill extends to everything that's in close-up, not just the characters. The hi-res version of Primo's aeroplane shows every single armor seam and bolt – and even rivet heads are detailed! Also worth noting that most of these hi-res stand-ins are actual dynamic entities and not static picture layers we used for cinematics in the first game. In layman's terms; They move like actual characters instead of posing for close-ups. 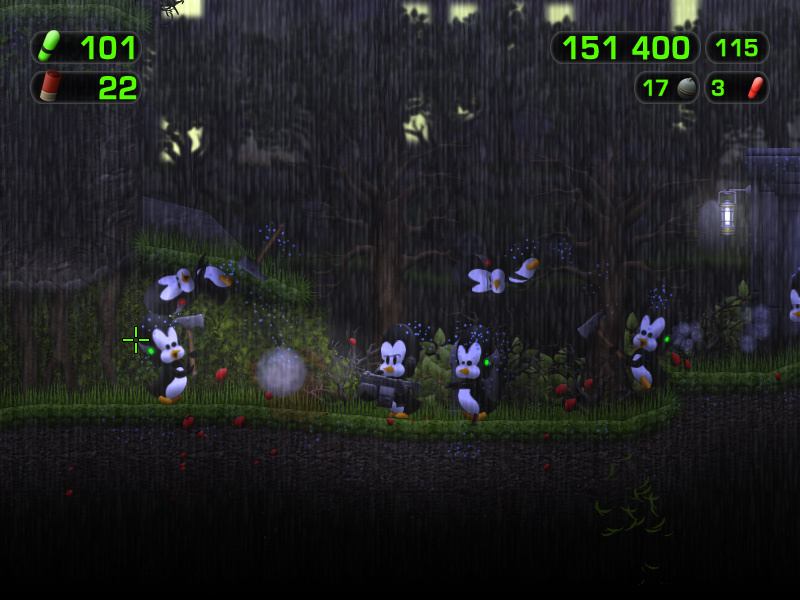 As I already gave away this level section in our October blog update, here's a proper screen capture from the graveyard. A trip to graveyard filled with hatched-wielding psycho-penguins and robe-wearing penguin cultists? Check. Add an ominous lighting, a thunderstorm and dark, foreboding soundtrack and you're ready for the next year's Halloween. We didn't plan to release another jungle shot, but during our capture session this scene just turned out too awesome not to share. This is an excellent demonstration of our new effects engine in action, proving the visuals can keep up with the crazy demands of the action itself. 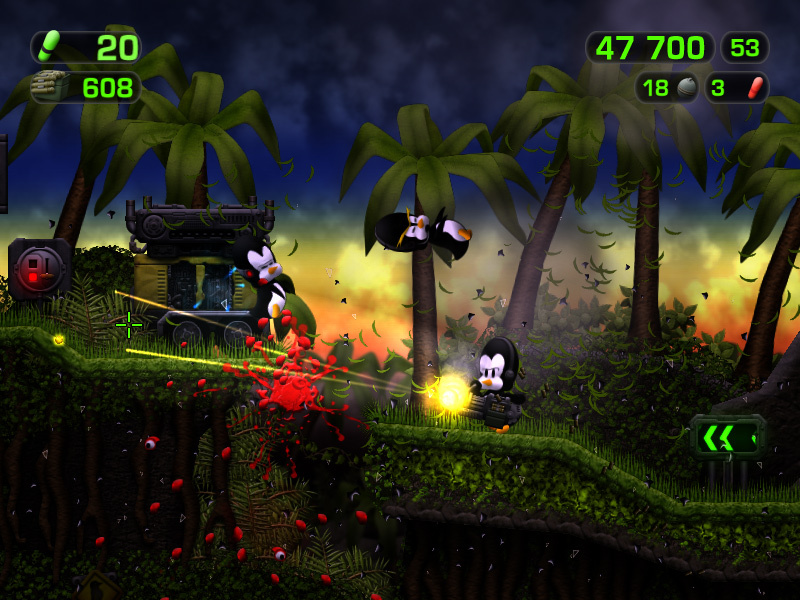 It doesn't matter whether you're shooting few zombie-penguins with a shotgun in a test-tube environment or letting rip with a minigun in dense jungle, the visuals match action. One of the surprisingly few things that has gone over multiple reincarnations in TAGAP 2 is the title screen, but here is what I hope is the final version. There's a story to this, actually. The very first one was blackness with 'T2' shaped hole in it, showing flames behind it. Then the new Turok happened, featuring almost exactly the same title scene, only in brown-ish palette. 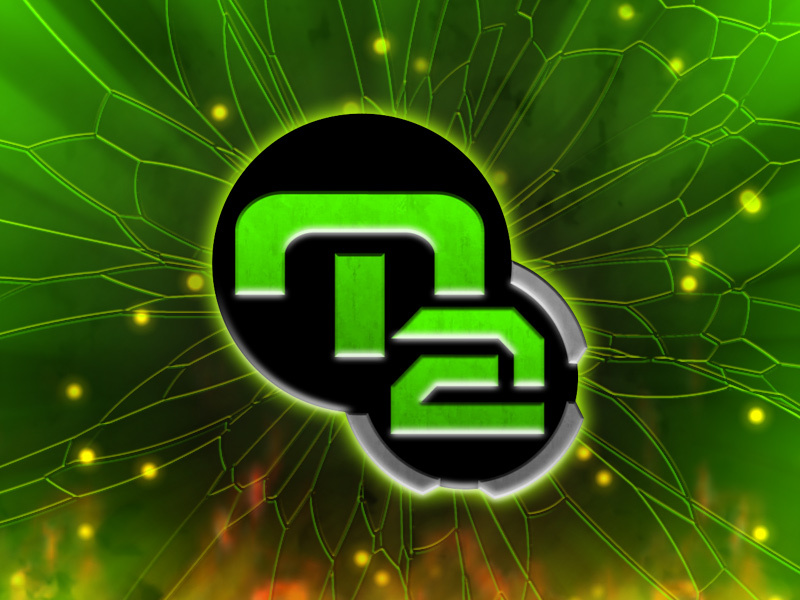 Since Turok's logo icon already happened to be bright green T on black plate, I wanted to distance TAGAP from it as much as I could. The second version was the opposite; Flames on the foreground and the logo looming ominously in the background. And what happens next? Gears of War 2 happens, that's what. I took a small break, planning a third version, which would've involved our heroes on the greenish background, but before I even started it, I saw almost identical rendition as Left 4 Dead loading screen. So, back to the original concept of logo splashing to the screen. So, how about it actually splashing there, with paint spattering on screen? It looked good, at least until Gearbox used the identical style for their own logo in Borderlands start-up. At this point, I seriously considered just fading the logo in, but decided to give it one more go; How about the logo hitting the screen so hard the 'screen' itself cracks? And let's add the flames back, yes? Excellent! And this time it's final. I hope. I hope you enjoyed these new TAGAP 2 media snippets. Also, if you haven't checked out our Season's Greetings card we crafted to you all, please do. But I've already taken enough of your time; Go and have a nice and peaceful holiday! 2011 will be awesome year in videogames – not only thanks to TAGAP 2 – so you'll need to rest before the great titles start rolling in.